Last weekend I spent a few days in Copenhagen in Denmark. I fell in love with the city because of its distinct character and charm. I was actually lucky enough to get a bit lost which allowed me to spend a day wandering the streets soaking it all in. The colorful houses, large historical buildings, cobblestones and canals seem old-fashioned at first, but Copenhagen is a very lively 21st-century city. My hostel was in a prime downtown location, right next to the pedestrian shopping district called the Stroget, which is full of shops, bars and cafes. 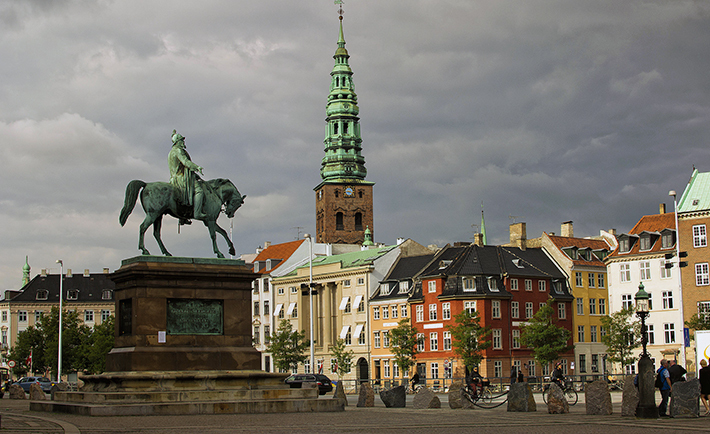 If you are on a budget, the city has plenty to offer for free or discounted prices, and one way to ensure you see as much as possible without spending too much money is to purchase a Copenhagen Card. The card includes admission to many of the historical attractions and museums, and free public transportation on the bus system as well as the metro and train systems, which are new, clean and very efficient. The card includes a canal tour in a covered, heated boat that gives a good overview of the city and its different districts. The boat made several stops, including the Nyhavn neighborhood. Located on the waterfront with pastel townhouses and little cafes, the area is one of the most peaceful and pleasant that I visited. In terms of food, the Smorebrod is a traditional Danish dish, similar to an open-faced sandwich that comes with a wide variety of toppings and is relatively cheap. There are many restaurants and cafes in the Stroget area as well as the up-and-coming Vesterbro district, but a less touristy option is the Street Food market, located in a warehouse on Paper Island. The market houses indoor food trucks with options ranging from traditional Danish fare to Italian and French options. For dessert, one option is “snegl” buns, which are round pastries with cinnamon and sugar. You also can’t go wrong with ice cream, which can be purchased in a cone with churros, on a waffle, or with a marshmallow on top. Danish fairytale writer Hans Christian Andersen clearly made his mark on Copenhagen: there is a street that bears his name, along with a statue of his likeness and a museum dedicated to his stories. Perhaps the most iconic image of Copenhagen, the Little Mermaid statue, is based on his fairytale. The mermaid herself is small, but the pleasant walk along the water to see her is worth it. Seeing a whole city in only a few days is difficult, but I got a good feel for the culture and history and recommend the city to anyone looking for an adventure.